I have been hoarding this delicious recipe for a little while, for which I apologize. I love cooking Asian dishes, but moreover, I love eating Asian dishes. Ok ok…really, I just love eating. I know that some foodie snobs and Asians out there are reading this blog saying, “that’s not really Asian” or “that’s not really Korean.” And yes, you’re probably right. I actually prefer to use the term “Asian-inspired,” as I know that many dishes that I cook, and many dishes in the blog world, period, are not truely and authentically of the country in which they are inspired from (Asian, European, African, South American, and I can keep going…). 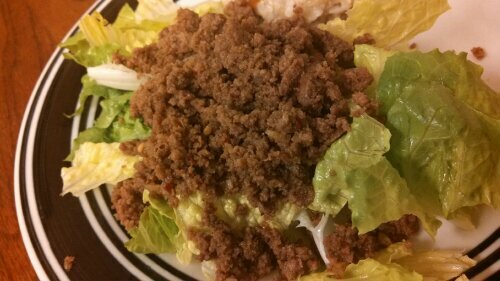 I ended up using ground turkey instead of ground beef, because I had gone to a store that did not have anything healthier than 85% lean beef and turkey, so I bought turkey instead, as it was the healthiest option, of the choices I had. I was pleasantly surprised that the turkey worked as well as it did – it soaked up the flavours just like beef would and it did not dry out at all! 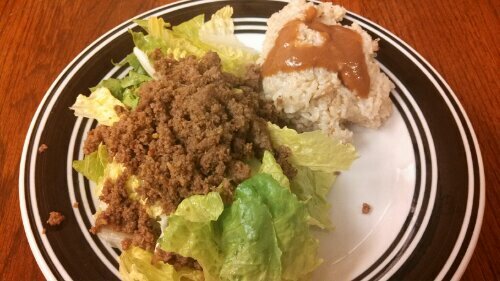 I served this over shredded lettuce with a side of brown rice (as you can see, I poured a bit of peanut sauce over my rice). A great, healthy, low-cal and low-fat meal! And it’s ready super quick! Bonus: ground beef or turkey is often much cheaper than steak or ribs! -Heat a large skillet over medium heat. Brown the ground beef in the sesame oil. Add the garlic towards the end of browning and cook for a couple of minutes, then drain the fat. -Add the brown sugar, soy sauce, ginger, salt and pepper and red pepper. Simmer for a few minutes to blend the flavors. -Serve over steamed rice or lettuce and top with green onions.